For the first time, sound recordings documenting the work and lives of notable cultural figures such as Julia Alvarez, Truman Capote, William Faulkner, Norman Bel Geddes, Norman Mailer, Anne Sexton, and Gloria Swanson will be publicly available for research. We’re thrilled to announce that the National Endowment for the Humanities (NEH) has awarded the Ransom Center $195,141 to preserve, through digitization, 2,862 at-risk sound recordings. This large-scale, two-year project begins September 2018. 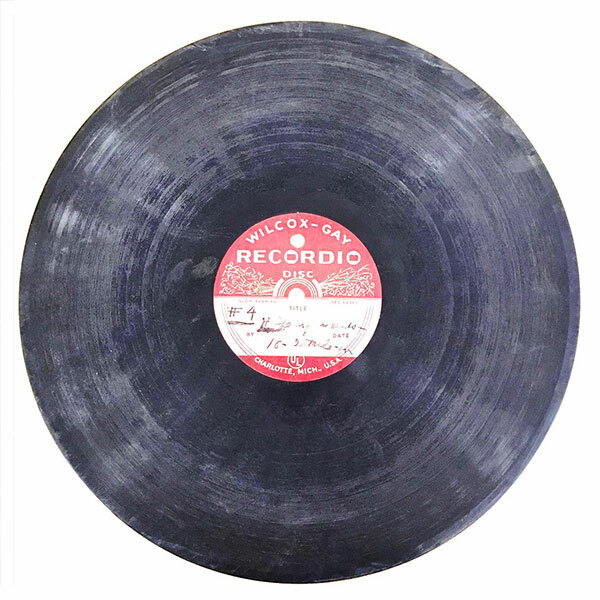 Our curators, preservation specialists, archivists, and librarians identified these recordings, from 48 collections, as priorities for preservation and access based on their significance, rareness, and physical condition. All of them complement physical papers, manuscripts, documents, works of art, published works, artifacts, and other items in the archives of their creators. 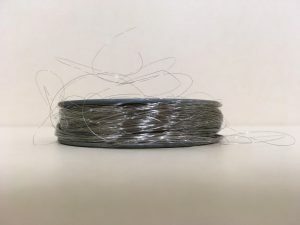 While those materials have been available to researchers for years, the sound recordings—the majority of which have not been transferred to a digital format—have been unavailable for research, leaving a critical body of unique information hidden. 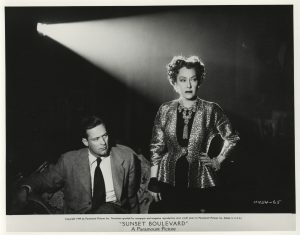 Paramount Pictures Inc. [Film still with Gloria Swanson and William Holden in Sunset Boulevard], 1949. Gloria Swanson Papers, 141.9. Many of the recordings from the Gloria Swanson (1889–1983) collection relate to a mostly forgotten but important story from her career. Soon after the release and success of Sunset Boulevard (1950), in which Swanson gave one of the most memorable performances in the history of film, Swanson had the idea to turn the story into a Broadway musical, more than 40 years before Andrew Lloyd Webber’s version reached the stage. Swanson commissioned songs from Richard Wyler and Dickson Hughes and actively developed and promoted the stage show, which she called Boulevard! Paramount Pictures ultimately rejected Swanson’s request for the rights, and she was forced to abandon the project, but many songs from the never-produced Boulevard! are documented in Swanson’s recordings. Other recordings capture Swanson singing and vocalizing during rehearsal. David Douglas Duncan. 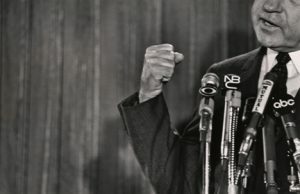 Presidential candidate Richard Nixon responds to a question at his press conference, 1968. David Douglas Duncan Papers and Photography Collection, 149.10.1. Photojournalist David Douglas Duncan (b. 1916) is known for his dramatic photographs documenting combat in the Korean War, the Vietnam War, and other international conflicts. The recordings in his extensive archive—which is one of our most frequently accessed photography collections—include interviews with the photographer about many aspects of his career, such as his work speaking out against the war in Vietnam. Many interviews relate to his work and friendship with Pablo Picasso, including recorded conversations with Jacqueline Roque, Picasso’s second wife. 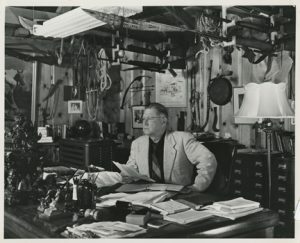 Unidentified photographer, Erle Stanley Gardner seated at his desk in his writing cabin at Rancho Paisano in Temecula, California. Erle Stanley Gardner Papers, Literary File Photography collection. Erle Stanley Gardner (1889–1970) was a lawyer and author best known for his popular detective series Perry Mason, represented in more than 80 novels, a radio series, and a television series. Gardner also initiated a project called “The Court of Last Resort,” in which he reviewed cases against criminal defendants believed to have been wrongfully convicted. Our extensive Gardner collection includes recordings of Gardner drafting and editing his writings and dictating correspondence, legal recordings related to “The Court of Last Resort,” and dialog from the Perry Mason radio program. Detail of a reel-to-reel tape.. The majority of the Ransom Center’s non-commercial sound recordings are rare or unavailable elsewhere. There are currently almost 15,000 recordings cataloged in our sound recordings database; over 3,000 of those have been digitized and are available for streaming onsite in our Reading and Viewing Room. By the end of this NEH-funded project, more than 6,000 sound recordings will be publicly available. Side view of a wire recording. The clock is ticking on how much time we have left to preserve the vast numbers of analog sound recordings held in archives and libraries around the world. A combination of physical degradation of sound recording carriers (e.g. 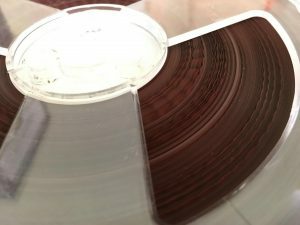 cassette tapes, phono discs, dictabelts) and the inability to digitize recordings due to the challenges of acquiring and maintaining historical playback equipment put millions of unique and rare cultural records at risk. Many professionals in the preservation field agree that in about 10 years we will face a point of no return. It’s with NEH’s invaluable support that the Ransom Center can continue to work to race against time. NEH-funds condition assessment of non-commercial sound recordings. Cunningham-Kruppa is the Ransom Center’s Associate Director for Preservation and Conservation. She has been a practitioner, educator, and consultant in the field of cultural record preservation for over 30 years. In 2016 Ellen was awarded the American Library Association’s Paul Banks and Carolyn Harris Award in Preservation. She holds a Ph.D. in American Studies and an MLIS from UT Austin, and is an affiliated assistant professor with the University of Delaware/Winterthur Program in Art Conservation. She received an Endorsement of Specialization in Administration of Preservation Programs from Columbia University’s School of Library Service. Her book on the cultural history of library and archives conservation education in the U.S. is forthcoming from Legacy Press.